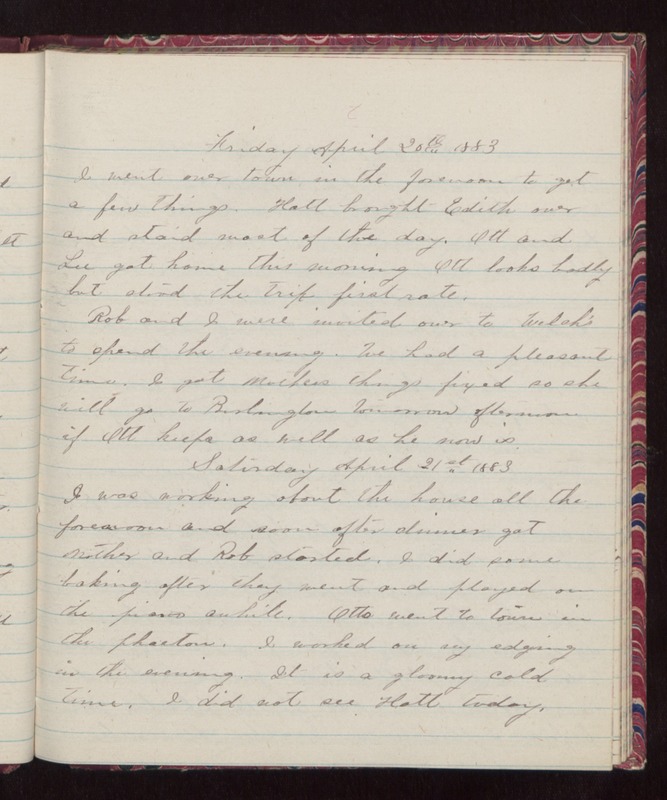 Friday April 20th 1883 I went over town in the forenoon to get a few things. Hatt brought Edith over and staid most of the day. Ott and Lee got home this morning Ott looks badly but stood the trip first rate. Rob and I were invited over to Welch's to spend the evening. We had a pleasant time. I got Mothers things fixed so she will go to Burlington tomorrow afternoon if Ott keeps as well as he now is. Saturday April 21st 1883 I was working about the house all the forenoon and soon after dinner got Mother and Rob started. I did some baking after they went and played on the piano awhile. Otto went to town in the phaeton. I worked on my edging in the evening. It is a gloomy cold time. I did not see Hatt today.